1.Preheat oven to 425°. In large bowl, toss squash with 1-1/2 tablespoons oil, 1/2 teaspoon salt and 1/4 teaspoon pepper. Evenly spread squash in large rimmed baking pan. In same bowl, toss beans with 1-1/2 tablespoons oil; evenly spread on separate large rimmed baking pan. Roast squash and beans 10 minutes. 2.Meanwhile, in same bowl, toss mushrooms with 1-1/2 tablespoons oil; evenly spread on third large rimmed baking pan. 3.Stir squash and beans. 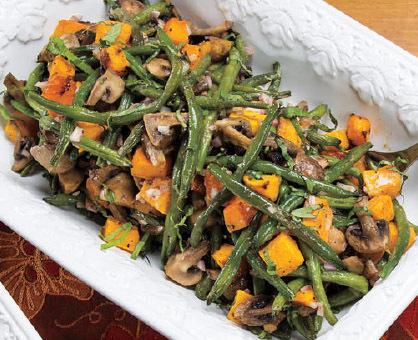 Roast squash, beans and mushrooms 15 to 17 minutes longer or until vegetables are tender and lightly browned, stirring once. 4.Meanwhile, in separate large bowl, whisk together vinegar, mustard, and remaining 1-1/2 teaspoons salt and 1/2 teaspoon pepper until well blended. Whisking constantly and vigorously, very slowly drizzle remaining oil into vinegar mixture until dressing is emulsified; stir in basil and shallots. Add vegetables and toss to combine. Makes about 14 cups. Squash and mushrooms can be cut and beans can be trimmed and refrigerated in separate zip-top plastic bags up to 1 day in advance. Vinaigrette can be prepared, covered and refrigerated up to 3 days in advance.